Digging deeper than previous cancer genomic studies, the PanCancer Initiative has released an analysis of 33 types of cancer across more than 10,000 patients. The new analysis shows that all 33 cancer types, based on their cellular and genetic makeup and independent of their anatomic site of origin, could be reclassified into 28 different molecular types, or “clusters”. Nearly two-thirds of these clusters were considered heterogeneous as they contained up to 25 different histological tumor types that, traditionally, would all be treated differently. These findings, generated by The Cancer Genome Atlas (TCGA) project, suggest new possibilities for immune-based and other novel cancer therapeutics, and may encourage clinicians to obtain and utilize comprehensive genomic information to enroll their patients into specialized “basket” or “umbrella” clinical trials. Taken as a whole, the findings constitute the PanCancer atlas, which appeared April 5 as a collection of 27 papers across of suite of Cell journals. In Cell, one of the more general articles (“Cell-of-Origin Patterns Dominate the Molecular Classification of 10,000 Tumors from 33 Types of Cancer”) noted that the PanCancer collaboration’s previous analysis had included only a third of the final set of TCGA tumors. Altogether, the TCGA researchers identified about 300 genes that drive tumor growth. And, remarkably, just over half of all tumors analyzed carry genetic mutations that could be targeted by therapies already approved for use in patients. “Rather than the organ of origin, we can now use molecular features to identify the cancer's cell of origin,” said TCGA scientist Li Ding, Ph.D., an associate professor of medicine and director of computational biology in the Division of Oncology at Washington University. “We are looking at what genes are turned on in the tumor, and that brings us to a particular cell type. According to Dr. Ding, the research supports the idea that tumors of any type with high numbers of mutations—which often are resistant to chemotherapy—are susceptible to immunotherapy drugs called checkpoint inhibitors. Highly mutated tumors produce comparatively more misshapen proteins that can trigger an immune response. But as a safeguard against autoimmunity, the body often puts the breaks on such an immune response. Still, to treat aggressive tumors, checkpoint inhibitors can remove those breaks, letting the immune system fight the tumor more effectively. The project focused not only on cancer genome sequencing, but also on different types of data analyses, such as investigating gene- and protein-expression profiles, and associating them with clinical and imaging data. In the first summary paper, the authors summarize the findings from a set of analyses that used a technique called molecular clustering, which groups tumors by parameters such as genes being expressed, abnormality of chromosome numbers in tumor cells, and DNA modifications. 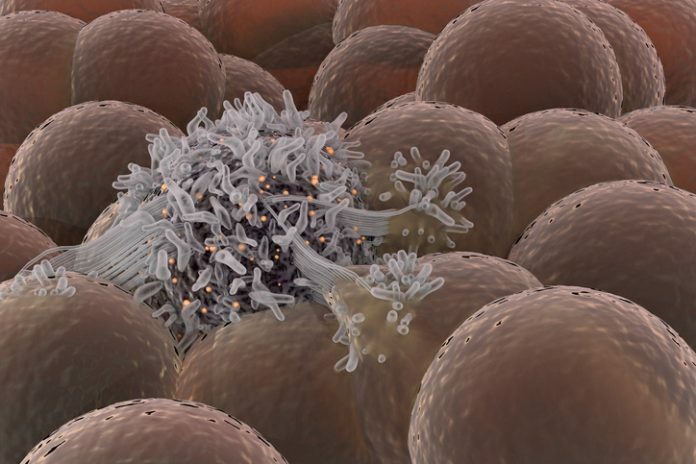 The paper's findings suggest that tumor types cluster by their possible cells of origin, a result that adds to our understanding of how tumor tissue of origin influences a cancer's features and could lead to more specific treatments for various cancer types. The second summary paper presents a broad view of the TCGA findings on the processes that lead to cancer development and progression. Specifically, the authors noted that the findings identified three critical oncogenic processes: mutations, both germline (inherited) and somatic (acquired); the influence of the tumor's underlying genome and epigenome on gene and protein expression; and the interplay of tumor and immune cells. These findings will help prioritize the development of new treatments and immunotherapies for a wide range of cancers. The third summary paper details TCGA investigations on the genomic alterations in the signaling pathways that control cell-cycle progression, cell death, and cell growth, revealing the similarities and differences in these processes across a range of cancers. Their findings reveal new patterns of cancer's potential vulnerabilities that will aid in the development of combination therapies and personalized medicine.